In the past 1.5 months, this is what I have been doing in the kitchen, once, or even two batches every week. I have occasionally made croissants before, however, this time I really want to get the techinques down. 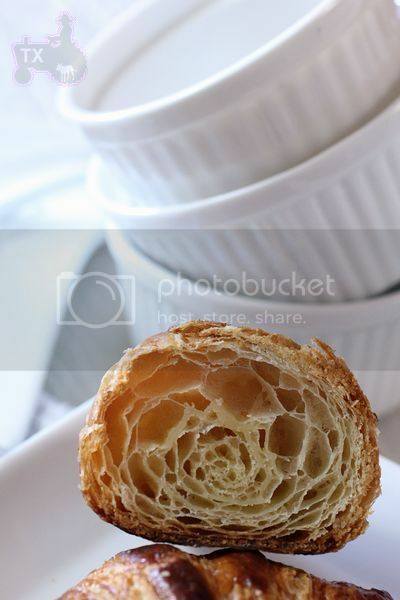 My idea of a perfect croissant: golden flaky high on the outside, crisp layers and honeycomb like crumb inside, and of course, buttery rich taste. Using European style butter (Plugra), in TX warm weather, with no professional equipment (no sheeter here! ), it's a process that requires patience, thorough understanding for each step, a lot of attention to details, and insane amount of practice. I am nowhere near "perfect" yet, but heading in the right direction, here are some lessons learned in the process. First, the following are resources that helped me a great deal, many thanks! 1)"Advanced Bread and Pastry". This book has a whole chapter on viennoiserie, the formula I am used is adapted from it. However, the formula and procedures require quite a bit of changes in a home kitchen. 2)Hamelman's formula from here. while I didn't use his ingredient ratios, but his procedure is much more suitable for a home kitchen, comparing to what's in AB&P. 3)Ralph from this thread. The whole thread is helpful, but Ralph's input was extra enlightening to me. I emailed him asking for the formula he uses in the shop. Since his posting was from over a year ago, I really didn't expect a reply, but he did write back! I really appreciate his insight and generosity. 4)Many enlightening posts from TFL, especially andy's post here. Since I made many mistakes along the way, and learned a lot form each of them, I am writing them all down below. Warning, it's long. I mean looooooooong. 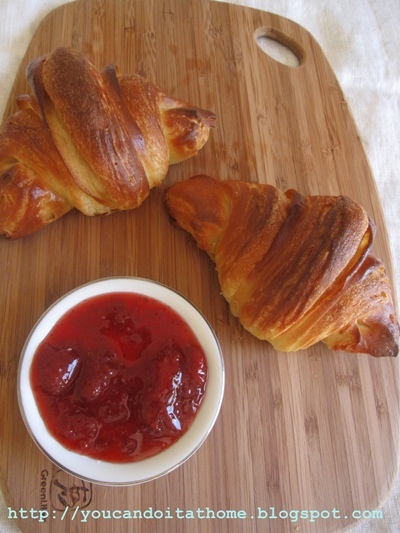 *I get about 12 standard sized croissants from each batch, with some small rolls from scraps. 1. mix and ferment 12 to 16 hours. NOTE 1, there are two poolish croissant formulas from AB&P, one for hand rolling, one for sheeter. The sheeter one has less liquid and less rest time between folding and rolling, the hand rolling one has much more liquid and more rest time. I find drier dough would give a more well defined cleaner crumb structur, but it's harder to rol out; wetter dough would be easier to roll out, but the crumb would be more sticky and less layered. What I try to do is to adjust the liquid amount so that it's dry, but still possible to roll out without messing up the layers. In the end, this amoutn is closer to the sheeter formula (the hand rolling one is way too wet for me), but with a tad more liquid. NOTE3, this is probably the most important lesson in terms of ingredients. The industry standard for rolling in butter is apparently 25% of the dough weight, which comes out to be about 45%of flour weight. Andy says it's about the same over the pond. However, I have found that in a home environment, when the rolling is less even and efficient, more rolling-in butter is needs for a well defined crumb. The less butter to use, the thinner the butter layers are, which means easier for the butter to melt into the dough or leak out. I have increased the roll-in butter ratio to 55% of the flour weight, about 30% of dough weight, which gives me much more consistent good results. I know many have said more butter would cause butter to leak out during final proof or baking - it's simply not true. Butter leakage during proofing is caused by proofing temp being too hight, and butter leakage during baking is caused by under-proofing, neither is related to the amount of roll-in butter. With 55% of roll-in butter, zero butter is leaked during proofing for me, minimal leaks during baking - sometimes none at all. 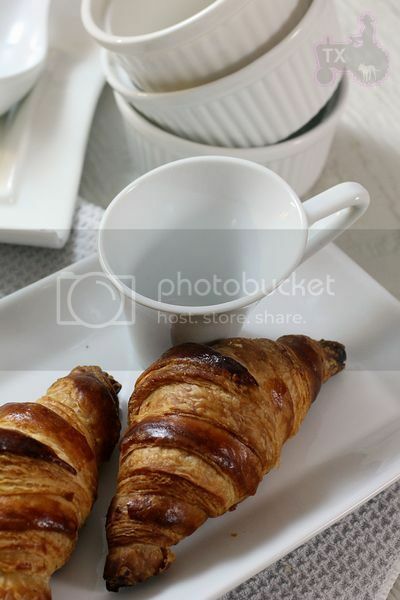 NOTE4, I use Plugra European style butter for most of my croissants. Have also used Kerry Gold occasionally. Both taste great. I would suggest to stick to a good European butter, different brand handls a bit differently. My Chinese baking friends can buy "butter sheets" which are 100% butter with high melting point. Those are much easier to handle, but I have not found any here in US, if anyone knows a resouce pelase let me know. In fact if anyone knows why we don't have such a thing here, I am curious to know as well. Those are made in New Zealand and Europe. 1. Mix everything but the rolling butter, knead until gluten starts to form. In my KA mixer, 3min at first speed, 3 min at 3rd speed. The dough is not very smooth, but not sticky. Pat flat and put in fridge for at least 2 hours, or overnight. NOTE5, some recipes ask for a thorough kneaded dough, some ask for no kneading at all. I think the objective is to have a strong dough with well developed gluten structure AT THE END. All the rolling, folding, even relaxing in the fridge would strengthen gluten, so it's not a good idea to knead the dough too well in the beginning. It will make rolling near impossible (if you don't have a sheeter). NOTE6, some recipe would ask for some bulk rise time at room temperature. I think it's not suitable for home bakers. Bulk fermentations strengthen the dough, which means one would need to play with knead time, and rolling technique to accomodate the added dough strength. Furthurmore, there are a lot of resting in my procedure because the dough would get too tight or too warm. With a bulk rise, I am risking over fermentating, which would cause the final proof and oven spring to be weak. 2. Cut the roll-in butter into pieces, put between two sheets of plastic or wax paper. Use a rolling pin to tap the butter until it's soft enough to roll, roll between the two sheets until it's a 7.5X7.5inch square. Put in fridge. NOTE7, this is a good time to learn how your butter behave. How long does it take for it to get soft? How long until it's melty? That's the guideline for later. 3. Roll the dough out until it's double size of the butter sheet, 11X11inch in this case. Tap butter until it's roll-able, and the texture is similar to the dough. 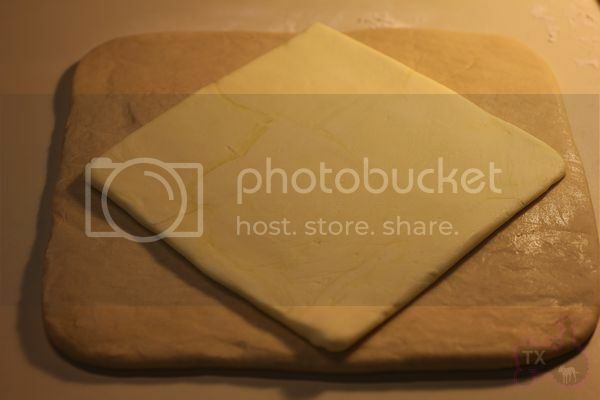 put the butter in the middle of the dough as following, fold up dough and seal the butter. Pay attention to corners and edges, you don't want spots where there's no butter. NOTE8, as Ralph emphasized in his posting: don't trap the dough! 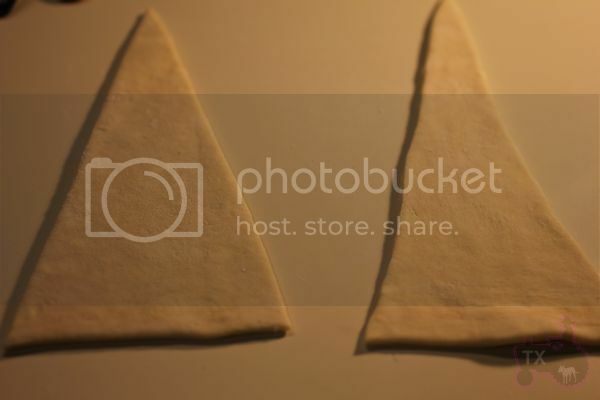 Before folding, cut the edge off to expose the layers before folding that side into the crease of the dough, that way there's no "extra trapped dough". NOTE9, even though at this stage, it doesn't seem important to roll the dough out into specified sizes, but you will get better results if you do. The reason is simple: if your dough piece is smaller at this step, you will have to do more rolling in the later steps. Later steps would have more layers of butter, which means it will be harder to roll out evenly. Roll out the dough to the size now. NOTE10, pay attention to corners and edges. Every imperfection would be magnified 27 times because you are folding 3 times. 5 Put in fridge and rest for 1 hour. Take out dough and repeat the rolling and folding 2 mroe times, which gives 3 folds in total. NOTE11, I had the misconception that the more folds, the more layers, the flakier it will be. Wrong. With too many folds, butter layers would be thinner and thinner, and it will be more likely for the butter to melt and leak. Even with perfect rolling, too may layers would mean smaller honeycomb "holes" in the crumb. With no sheeter and TX weather, I find 3 folds sufficient, any more it's risky. NOTE12, 1 hour is "MINIMAL" resting time. I often have rested longer since I was doing something else. There's no harm in resting a bit longer. During final fold, I sometimes have to rest it in the middle in order to roll out to the desired size. Sometimes when it's way too warm (the curse of TX, at one point I was rolling out croissant while hubby was eating watermelon in a tshirt), I would also rest in the middle to avoid butter melting. It's always better to be overly cautious. Allow you self more time than your expect. 6. Put in fridge and rest for at least 90min.Roll out to 9X36inch, 1/8inch thickness. NOTE13, I don't have such a big counter space, niether do I have such a big fridge, so I cut the dough in half, which means I have 2 pieces, each one is 9X18inch. NOTE14, Rest often. Rest when there's any indication of butter getting too warm, or the dough getting too elasticy. There's no harm in resting too much. NOTE15, Use enough flour so the dough don't stick. 7. Cut into triangles, 4.5inch wide at the base, 9inches tall(the one on the left). Don't hesitate to cut off inperfect edges if you want a pefect crumb. Fridge and rest the triangle pieces, then strech them into 10inch high(the one on the right), this will creat more layers. 8. Roll up fairly tight, stretch out the tip with one hand when you roll the bottom with the other hand. You should get 3 rolls, and 7 little steps, wich the tip underneath. NOTE16, this is the straight shape, if you want a curved shape, you will need to cut a slit in the base before rolling, and roll to the outside as you start from the base. See Hamelman's formual link. 9. At this point, you can proof right away, fridge overnight and proof next day, or freeze (defrost overnight in fridge before proofing). Brush with egg wash (1 egg beaten with 1 TBSP of water), then proof @ about 80F until very soft and jiggly. About 3 hours for me. Brush another layer of egg wash after proofing. NOTE17, don't proof warmer than 80F, the butter might leak otherwise. NOTE18, don't under proof, otherwise butter will leak during baking. I have yet to overproof these. They have to be REALLY soft and jiggly. The layers will be very obvious at the end. NOTE19, the egg wash before proofing would reduce the requirement on proofing humidity. NOTE20, I have a madeshift proofing box made from foam box, a temperature sensor and control from pet shop, and a light bulb, works great. 10. Bake at 425F for 10min, 375 for 15min. Honeycomb enough? Not really, but getting there.They should be more well defined, and the wall of each cell should be thinner. For this one, I didn't cut off the imperfect edge before rolling up , which made the center too doughy. I don't even know whether a "perfect" croissant can be achieved in a home kitchen, especially a warm TX home kitchen, but I will keep trying. In the mean time, my family, friends, and coworkers are loving me for feeding them such delicious breads. I want you to do it! After appropriate training and practice, of course. Your croissants are just gorgeous, txfarmer. I don't believe I've ever seen one with as open a crumb. You cite the disadvantages of home baking compared to a commercial bakery, but I don't know that a professional would have the time to perfectly execute each little step as you have. Thanks for sharing what you've learned. All your hard work has certainly paid off. 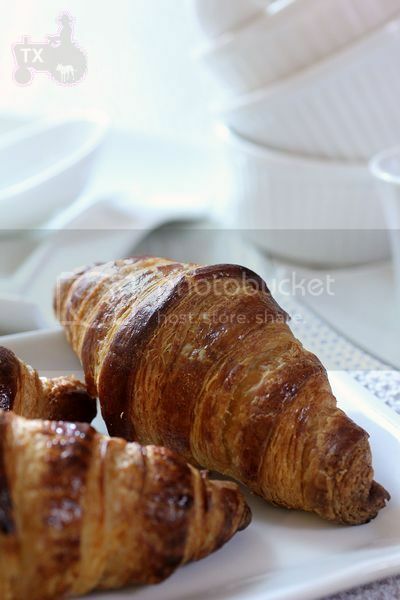 Your croissants are just gorgeous all around! Thanks for sharing! 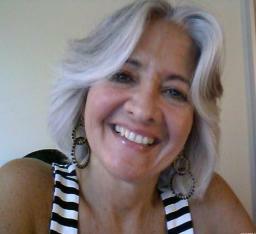 Thanks Sylvia, still got a long way to go but heading in the right direction. Yours border on perfection. Bravo! Nice croissants, Hamelman never lets us down huh? Gorgeous! Those are pieces of art! Funny you posted this, I'm too on my domestic croissant apprentice project. Starting from last weekend, I intend to make croissants every week until I get the hang of it. With anything, the more you do, the better you would be at it, and the more will be learnt along the way. I used the recipe from Bourke Street Cookbook which has approx 58% hydration, which I found a little too stiff a dough to work with, so far, I adjusted hydration to 60% which seems to work better. I also found that if the dough was left fermented, the texture become bread-like texture, and less flaky-like pasty texture. It's only my guess, and early-stage observation. That happened to me before, and I don't think it's not having enough butter. I think the bread-like texture comes from using dough that has fermented first before lamination. I remember that whenever I use a dough that fermented first before lamination, I always get bread-like crescents. It's a crunchy crust rather than flakes. I was watching videos and noticed that some bakers laminate immediately after they knead the dough. I found that this way creates the flaky texture. I prefer chilling the dough in the freezer. 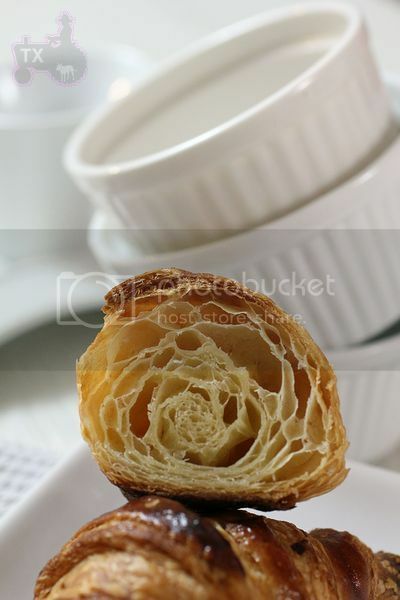 There are many details in croissant making that would affect texture. The bread like crumb is caused (most likely) by butter leaks/melts into the dough layers, which makes the layers less distinct. With a bulk rise, gluten in the dough gets stronger, which makes it harder to roll out. So you work harder during rolling, applyign too much uneven pressure, and cause the butter to leak/melt. I have seen croissants with bulk rise that's just beautifully layered. So it's not the bulk rise itself, it's the handling. Beautiful croissants, Txfarmer! Your description of your lessons in the text of your recipe is very useful. Someday I will try a laminated dough, and I will return to this post when I do. Thanks Glenn, it's a fun bread to practice. If these are your rejects, I will happily eat them. Seriously, they look just beautiful. I admire your quest for perfection and all the work you are prepared to do to get there. Your body of knowledge and thirst for excellence is inspiring. 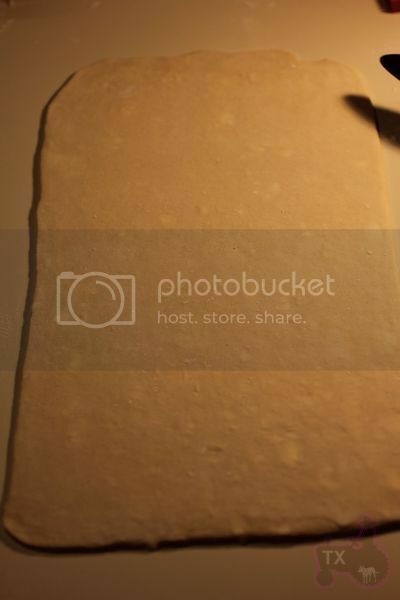 truly beautiful looking.. how do you get your dough rolled into such a perfect square to start the lamination process? amazing! Practice? And evenly roll to the corners. txfarmer, you have out done yourself with this step by step and all your detailed comments. Quite impressive work. Equally impressive is that you are apparently able to maintain your weight as a marathon runner while turning out multiple batches of rich croissants. I've made a few batches of croissants in the past with mixed results. I think I'll have to go on the hunt for the Plugra European style butter that seems to be key. Where did you find it in Texas? Thanks again txfarmer for your dedication to the artistry of the craft. Very inspirational. I find Plugra in Whole Foods and Central Market. While a good European butter such as Plugra is important, I wouldn't say it's the "key". The key is A LOT OF practice. What you are essentially doing is to creat even butter/dough layers, as even as a machine. To achieve that, all variables must be considered and practiced. How tight/dry should the dough be? How soft/hard should the butter be? How much force to apply? When to rest the dough? These are the "key points" that can only be learned by trial and error. Ralph's suggestion is to make them 4 days in a roll. I need to keep my job to pay for all that butter, so I just make once or twice each week, every time I have a long list of mistakes that I have made, and each one is an important lesson. Sorry txfarmer, I didn't mean to lesson the important aspect of technique in the making of croissants. I meant to express that the qualities of European butter make a big difference in the crumb. I checked our local WF and indeed they carry Kelley's (on sale) and Plugra. I have found that even @ same fat ratio, each brand of butter behaves just a tad differently. Plugra is less melty, but easier to break when it's too cold/hard/thick; Kerry Gold is less likely to break, but really melty. I really wish we had access to butter sheets, from what I heard form my Chinese baking friends, it makes life so much eaiser. great detail in the learning here, and I believe you have a wonderful result. Thanks Andy, your post was immensly helpful! The tough part about a hand rolled croissant is getting every roll of the dough to be exactly the same thickness. Easy with a sheeter - not so easy by hand. I'm always hesitant to give technique tips, but your write up is so detailed that I thought I would. I did take a class with Tim Helea (who makes a pretty fair pastry)on laminated doughs and he did a couple things that I haven't seen elsewhere. He made a big point about taking the block of butter and pounding it out to the "butter sheet" in one piece - rather than say, slicing it down into thinner pieces and patching them together. I don't know how you create your butter sheet, but he had us fold parchment paper into a "frame" that was the right size and pound and roll the butter into it (which is surprisingly easy and straightforward to do...). He felt that by pounding the butter out as a whole we did not create little cracks that will eventually become fractures in the laminated butter. I don't know if it is needed in Texas, but he made a point of doing the "tapping" as you call it of the dough before each rollout and turn - he felt that it made the butter just slightly more plastic and better to endure the rolling of the dough without fracturing. 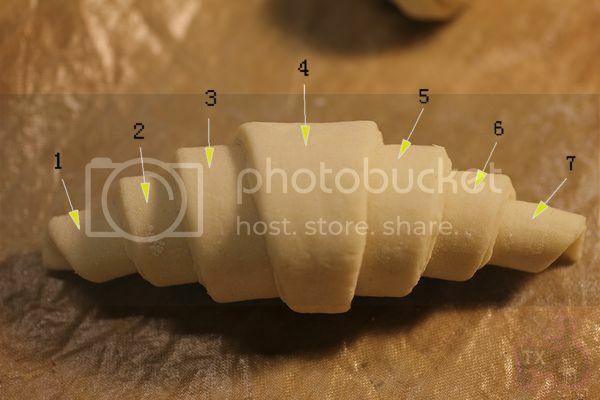 He cuts a slit at the base even when making straight croissants and (his innovation) puts a triangle of scrap dough as a bit of filler in the slit. He told us he feels that this creates better structure for the middle of the croissant. Again, didn't read any of these things in Mr Hamelman's book or in AB&P so despite the fact that those are really nice croissants - since you are aiming for perfection, I thought I would pass along the information. Also got a tip attending a Hitz seminar about taking all those little scraps that cause the croissant to be imperfect, lightly mixing them with fresh herbs and lightly pressing them into a ring mold to make a type of semi laminated bread for sandwiches, etc. Thought I'd pass that one along because I have always felt a bit wasteful to just throw away the scraps and I found that to be a pretty cool idea. I wonder if you talk to the croissants in English or French. BTW, I don't find this odd, unless the croissants talk back to you. I am sensitive to accusations of America bashing I always talk to croissants being made on American soil in Standard American English (as opposed to British English or regional variations on the American accent.) But I pronounce the actual name of the pastry in French because I learned the word first in french and don't know how to pronounce it in English. I've heard people say the word but can't myself do it. I appreciate all tips like you've given, they really help since croissant making is all about techniques and details. Yes, I totally agree that the end goal here is to roll like a sheeter, even application of force, easier said than done. So far, I have found that the biggest and best way to achieve this goal is to "listen to the dough". Old saying, but especially true here. I have learned to tune down my Type A personality when it comes to croissants. If it can't be rolled out easily in a couple of minutes, ok, in the fridge they go. No use forcing it, otherwise it will just mess up all the previous work. That's exactly how I pound out the butter block, except I use plastics instead of wax/parchment paper - big blocks, pound with a pin to roughly the thickness with no cracks, fold up the edges, then roll evenly. For the 1st and 2nd roll & fold, I do tap a little bit to get it to be roll-able, for later folds and rolls, I don't need to, my weather does it for me. Sigh. Now I will start talking to the dough as well, too back my French is nonexistent, hopefully my croissant dough understand Chinese! I have tried the scrap dough in the middle trick, it gives a higher volume, but I often screw up and make the center too doughy. Have to go back and improve on the way I incorporate it. You method of using the scrap dough is great. I have done a similar method, except use sugar and loaf pans, makes good tea cakes. I tried to do the butter pounding on plastic a few times and for my hands found the parchment to be so much easier. Each her own! This provides pretty good pictures for each step. Thanks for the link. It will be very helpful. I was wondering especially about something both you and Pat mentioned regarding the forming of the butter block. He [Tim Helea] made a big point about taking the block of butter and pounding it out to the "butter sheet" in one piece - rather than say, slicing it down into thinner pieces and patching them together. I don't know how you create your butter sheet, but he had us fold parchment paper into a "frame" that was the right size and pound and roll the butter into it (which is surprisingly easy and straightforward to do...). He felt that by pounding the butter out as a whole we did not create little cracks that will eventually become fractures in the laminated butter. I am hoping each of you will add detail to your method. Put a the full amount of roll in butter in the center of the parchment paper. Bash the butter with a blunt intstrument (some use a rolling pin - I use a piece of steel pipe) until it is almost the size that you want it to be. Trim edges a bit if you have gotten the thing really mishapen. 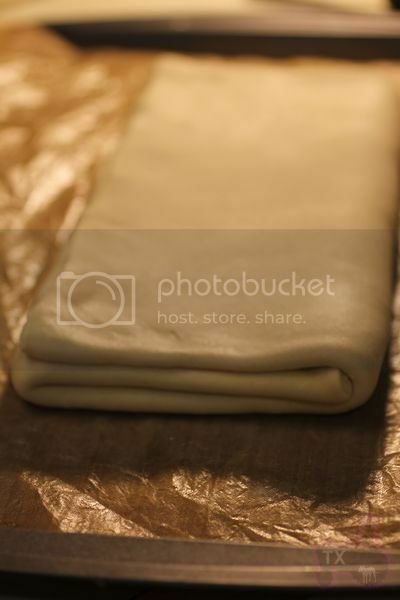 At this point you should be able to fold the edges of the parchment paper over the butter to make a kind of frame or template. Bash the butter into the frame a bit more. The you can cover the center of the butter with another piece of parchment and roll it out (with rolling pin or steel pipe) to an even thickness - the parchment frame will make sure that you have straight edges. That's the best I can do - Hope it helps. OK, that makes the 'frame' concept more clear. See? You're not such a bad teacher. Do you start beating on bare nekkid butter, or do you cover it for modesty's sake? I'm making croissants this weekend for the first time (more on my adventure soon). I found a YouTube video that shows the butter forming technique: (http://www.youtube.com/watch?v=vMfZBFQQ_es). I know this is five months after your question, but Txfarmer's croissant lessons are timeless, and perhaps this will add something. That video does make clear the butter pounding method. I'm afraid my laminate dough attempts will have to wait 'til October or thereabouts. This 100–110℉ we've suffered through off and on, mostly on, since May leaves my kitchen a bit on the hot side; at least while the a/c thermostat is on a sane value. Or, perhaps you're just rubbing it in; 58 degrees at game time in Oakland last night. It was still on the far side of a 100 here. It is true that it's usually cool in San Francisco in August, so butter won't melt fast in my kitchen. But if I wanted to list the benefits of living where I do, I wouldn't start with the weather. I did enjoy whomping on a big block of butter. When I am finally back in Oklahoma I will make croissants and will follow your lecture here - it will not happen before the Fall, I am not crazy enough to attempt croissants in the heat of OK Summer! OUtstanding post, TxFarmer, perhaps your best ever! What? You don't want to battle croissant dough when it's 110F out? You are missing all the fun, and melting butter! These are as close to perfection as I have ever seen from a home oven. And the tutorial/notes are exellent too. Fantastic job! Thanks Susan! It's a pleasure to have you dropping by! I have never tried croissant making - but I will I hope. What an inspiring post, beautiful photos, notes, thank you so much! and the croissants came out much better than usual: the crumb was much more open, the softness was seriously increased and the shape was maintained much better than all other times. Maybe I should have waited more time between the folds because lamination was a pain: the dough was too firm to spread. Thanks, txfarmer! 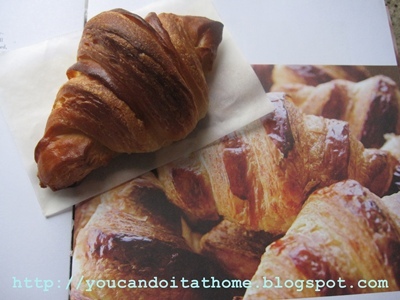 For the first time I obtained croissants with the right consistence. I still prefer much more sugar in the dough (25-30%) but this recipe is a good starting point for me. Your croissant post has been immensly helpful. I have been reading and re-reading it along with the links to other croissant discussions that you include. Do you have any tips for preventing the butter block from breaking up into large chunks during lamination? My butter always does this and, not only does it keep me from getting nice, even layers of butter and dough, but the butter chunks often cause the dough to tear and the butter breaks through it. 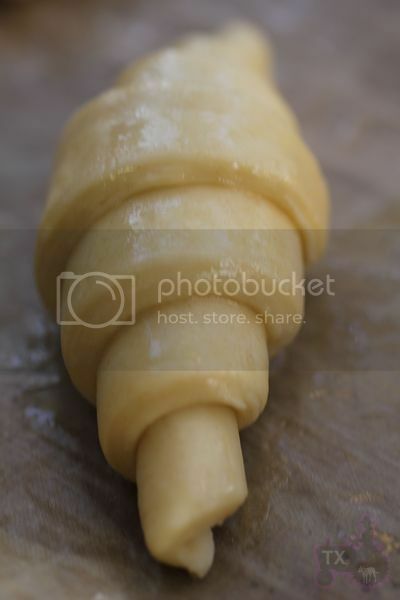 It seems like rolling out the dough when it is at a warmer temperature would keep the butter soft enought to spread rather than break, but all the literature on croissant-making always stresses the importance of keeping the dough cold. I am laminating by hand with a rolling pin. Is it something about my rolling technique that possibly causes this? Whilst your butter should not be in any way warm, you are either working with it too cold, or cut too thickly. Your comment about "keeping the dough cold" remains a key principle. So work with your butter, not dough to overcome this problem. Thanks for your input, Andy. My butter is definitely quite thick when I put it into the dough. Next time I will try rolling out my dough into a larger piece so the butter can be applied in a thinner layer. I think the key here is that the dough and butter need to be of same consistency if you want them to "follow" each other. You said butter is breaking, then it might be too hard/colder for the dough, OR/AND the dough is way too soft/extensible. Either way it's not a good idea to "warm up" the butter, once it melts, you won't get any layers. You can tap the butter block a bit to soften it though. In the past I have made the dough softer in order to make rolling it out by hand easier, but this last batch the dough was slightly stiffer in order to achieve a more honeycombed crumb like the ones in your post. However, it could probably still be a bit stiffer. It sounds they could be underproofed. Proofing time can go beyond 3 hours, depending on the temperature they were proofed. If it's on the cool side, they could proof more than 3 hours. There is no set time. I always look at the edges where the dough was cut. If the edges are rounded and puffy, that's when they have proofed enough. If the edges are still sharp, they're still underproofed. OMG, devine is just one adjective to use! They are stunning!